Immunostimulating drug of bacterial origin. Children's broncho-Vax stimulates the body's immune defense and increases resistance to infections of the respiratory system. 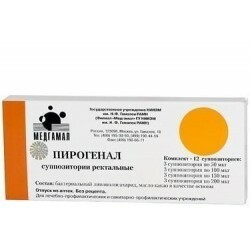 Immunopharmacological studies have shown that children's Broncho-Vax has the following effects: increases the formation of immunoglobulins A (IgA) secreted by the mucous membrane of the respiratory tract and saliva; increases the number of circulating T-lymphocytes. Clinically, a child's Broncho-Vaxom reduces the incidence of acute respiratory tract infections, reduces the duration of their course, and also reduces the likelihood of exacerbation of chronic bronchitis. This reduces the need for the use of other drugs, especially antibiotics. treatment of acute respiratory tract infections (as part of combination therapy). Excipients: anhydrous propyl gallate (E310) - 0.042 mg, monosodium glutamate (corresponds to anhydrous sodium glutamate (sodium glutamate)) - 1.515 mg, mannitol - necessary amount up to 20 mg, starch pregelatinized - 110 mg, magnesium stearate - 3 mg, mannitol - The required amount of up to 200 mg. The composition of the capsule shell: indigo carmine (indigotin) (dye E132) - 0.01 mg, titanium dioxide (dye E171) - 1 mg, gelatin - the required amount up to 50 mg.
Broncho-Vaxomom® Children are prescribed to children aged 6 months to 12 years. 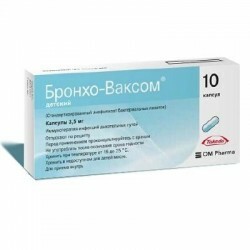 In order to treat: 1 capsule of the drug Broncho-Vaxomom® children's daily morning on an empty stomach until the symptoms disappear, but not less than 10 days. If necessary, antibiotic therapy Broncho-Vaxomom® Children should be taken in combination with an antibiotic from the start of treatment. The duration of treatment or the appointment of a repeated course of therapy should be determined by the doctor, based on the patient's health condition. 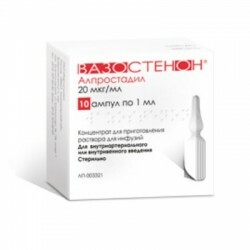 In order to prevent exacerbations and maintenance therapy: 1 capsule of the drug Broncho-Vaxomom® Children's daily morning on an empty stomach. The course includes 3 cycles, each of which consists of taking 1 capsule daily for 10 days, the interval between cycles is 20 days. If it is difficult to swallow the capsule, it should be opened and the contents mixed with the drink (including fruit juice, milk). Broncho-Vaxomom® children are usually well tolerated. The results of clinical studies suggest that the frequency of mild adverse reactions is 3-4%. On the part of the digestive system: nausea, abdominal pain, vomiting. On the part of the respiratory system: cough, shortness of breath. From the nervous system: headache, feeling of fatigue. In case of continuing gastrointestinal disorders, skin reactions and respiratory manifestations, the drug should be discontinued, since they may be allergic reactions. In such a situation, it is necessary to consult with your doctor. 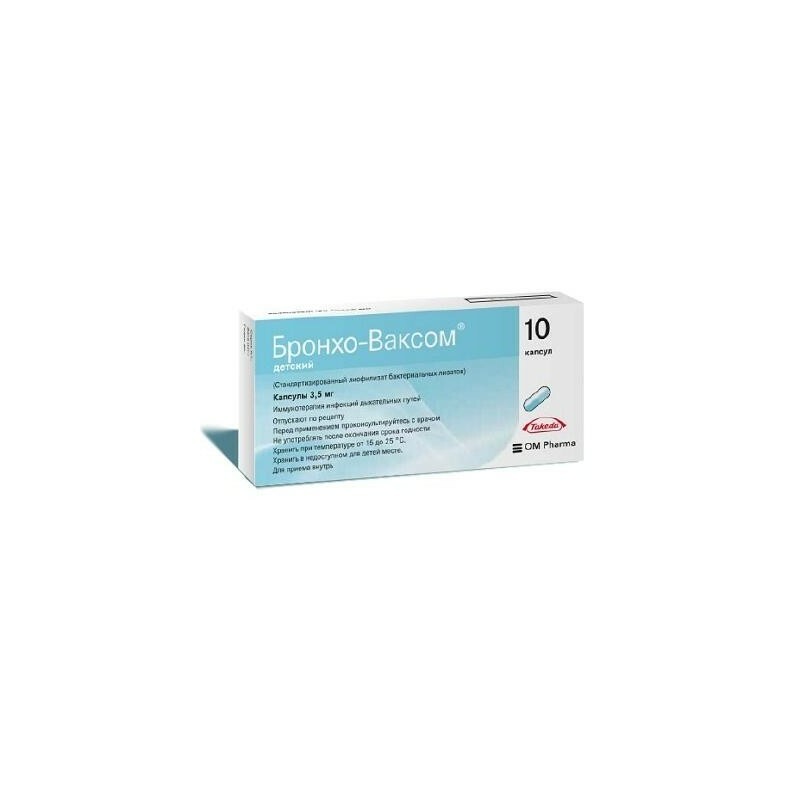 Broncho-Vaxomom® children can be used simultaneously with other drugs for the treatment of acute and chronic respiratory diseases. The interaction of the drug Broncho-Vaxomom® children with other drugs to date has not been established. Based on the available data it is not recommended to prescribe Broncho-Vaxom.®Pediatric children under the age of 6 months due to the immaturity of their immune system. In order to avoid overdose, do not use the drug from capsules intended for adults (Broncho-Vaxomom® adult capsules 7 mg). Broncho-Vaxomom® children does not affect the ability to drive vehicles and work with mechanisms. Information about cases of overdose are absent. The nature of the drug Broncho-Vaxomom® children and the results of the study of its toxicity indicate that overdose is unlikely. Dosage form: Capsules solid gelatin, size 3, lid blue opaque, body white opaque; the contents of the capsules are light beige powder.